It’s official: Silicon Valley isn’t the tech capital of America, at least for Generation Z. 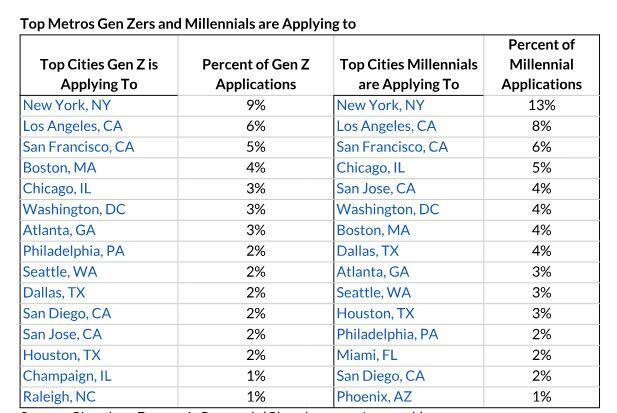 According to a study out last week from jobs site Glassdoor, New York is the city that receives the highest number of job applications from members of Generation Z, or Gen. Z, followed by Los Angeles, San Francisco, Boston, and Chicago. There’s a reason for that, according to Glassdoor economics research analyst Amanda Stansell, although it isn’t a flashy one. “This may be because there are a lot of Gen Zers there in university, with more universities actually nearby, so Gen Zers are applying to jobs that are also nearby,” hypothesized Stansell. In terms of sheer quantity, New York City is home to more universities and college institutions — well over 100 — versus San Francisco proper, which has around 25. For the purposes of its survey, Glassdoor defines the Gen Z demographic as individuals born between 1997 and 2012, with those born between 1997 and 2000 poised to enter the workforce over the next few years. Glassdoor based its findings on “tens of thousands” of Glassdoor reviews and job applications from Gen Z members started between October 2018 and January 2019. The majority of job applications came from older members of Gen Z.
There’s also the issue of rent prices, which are significantly less in New York than they are in San Francisco, the most expensive city in the U.S. According to apartment search engine site Rent Jungle, which tracks apartment rental data across U.S. cities, the median monthly rent for all New York apartments in January was $3,415, versus $3,772 in San Francisco. The disparity is even wider when looking at just one-bedroom apartment units. In New York, the average one-bedroom rented out for $2,831 a month, compared with $3,412 in San Francisco. But beyond the sheer number of nearby college institutions or lower rents, New York is also geographically a larger city with a larger, more diverse population, according to the U.S. Census Bureau. That may be a compelling draw to Gen Zers who want to live in a more diverse city. Gen Zers can still potentially work for larger tech companies like Google (GOOG, GOOGL), Microsoft (MSFT), Facebook (FB), Spotify (SPOT), and Square (SQ), which all have offices there, or a wide range of startups — Foursquare, Kickstarter and Birchbox — in a city that’s also dominated by finance, health care, and the arts, among other industries. “I firmly believe that the vast majority of people would rather live in NYC instead of Silicon Valley and that in the long run, every major tech company will end up setting up shop here in one way or another,” says Kurt Schrader, CEO and co-founder of the New York City-based startup Clubhouse, who expressed disappointment in Amazon’s recent decision to abandon its HQ2 headquarters earlier this month. Many Gen Zers, perhaps, would agree.